On September 11, 2001, the United States was attacked when hijackers crashed two commercial airliners into the “twin towers”: One and Two World Trade Center. As we all know, those buildings collapsed, along with other buildings in the area with other buildings being demolished because they were structurally unsound. As part of a memorial, the New York Port Authority, a government agency that owns the land on which the towers once stood, has selected a portion of the building rubble – crossbeams – to be part of the memorial structure. These crossbeams look, coincidentally and strikingly, like the Christian cross. This has caused issue with some atheists, and the organization American Atheists filed a lawsuit on that mark. Some important questions need to be asked. With all of this religious symbolism around the cross, along with the continual Christian backlash against attempts by Islamic organizations to build a mosque blocks away from Ground Zero, how can an attempt to erect something in the shape of a cross, that has been treated as a religious relic by so many people and organizations, not be in violation of the First Amendment? 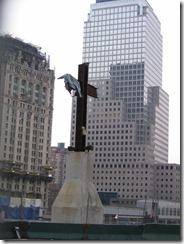 In my opinion, the Port Authority’s erection of the cross on public land is a violation of the First Amendment. But other atheists disagree. A New York lawyer who video blogs on YouTube under the name ProfMTH posted a video (below) and a blog article4 saying essentially that the lawsuit by American Atheists is “frivolous” because the cross is just a set of crossbeams like dozens of others also recovered from Ground Zero. There are so many other pieces of rubble they could have selected, yet this cross is what was chosen, likely for religious reasons. 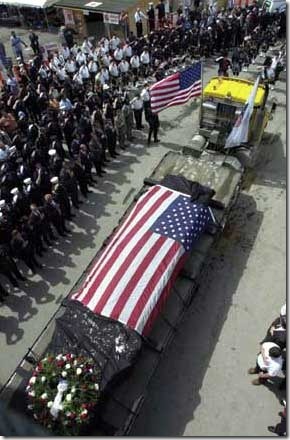 The site will forever be treated as hallowed ground by everyone who knows what happened there. Some will certainly pray on the site, and that is within their rights. Others will quietly reflect on history, like walking through a Civil War battleground. But what we don’t need is a religious relic being purposefully installed on public ground by a government agency. Too many people view “9/11” as an attack on Christianity by Islam, as if it’s another battle in a religion-on-religion war, primarily for the purpose of persisting the guise of Christianity itself being persecuted, just as Jesus was persecuted according to the Bible. Except it was no such thing. Yet this cross perpetuates that lie. It was not an attack on Christianity, just as the attack in the London subway 911 days after “9/11” was not an attack on Anglicanism. No one else in the world views “9/11” as an attack on Christianity, only Americans. Again it was not an attack on Christianity. The attacks of September 11, 2011, were attacks by Islamic mercenaries, who had trained in Afghanistan and were harbored by the Taliban government, against the United States of America.